Tod Browning's bizarre, elliptical Mark of the Vampire must surely rank among the strangest of the early Hollywood horror films — not an insignificant title considering the sheer variety of lunacy on display in the countless low-budget shock-fests churned out during this era. This outrageous film runs barely an hour long, and the evidence of the significant cuts it suffered at the hands of meddling producers — over twenty minutes worth of footage are reportedly missing — is apparent at every point. Who knows what Browning's original film was like, but the film as it exists now has a stuttery tempo that actually lends an air of accidental surrealism to the whole affair. Characters abruptly show up without introduction, times and locations collide awkwardly into one another, scenes end suddenly without resolving their action, only for a new scene to begin, without explanation, in the middle of something else altogether. Incidents happen and then seem to be forgotten just as quickly, as the timeline leaps forward and the same characters reappear in a totally new scenario. One tries desperately to follow the plot by reading between the lines of the fragmentary dialogue, trying to guess what could possibly be going on. The film is a complete mess, but a delightfully entertaining one. Its schizophrenic editing never settles down, never stops frenetically jumping around from place to place without providing any sense of context. From what I can gather, one night the nobleman Sir Borotyn (Holmes Herbert) is killed; he's found drained of all his blood and the local populace is terrified by the idea that a vampire did the deed. 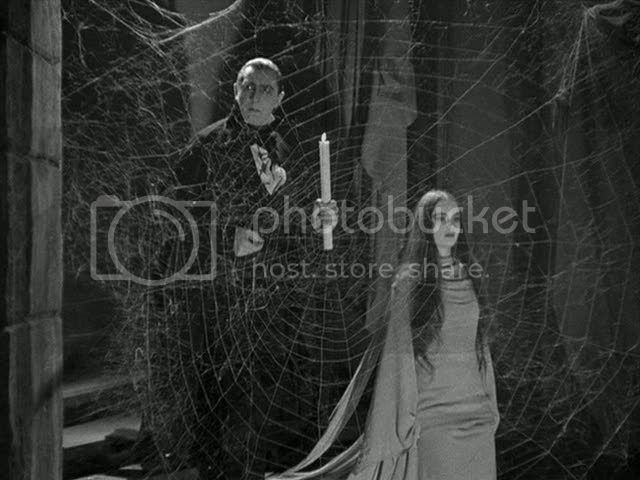 They pin the blame on the creepy Count Mora (Bela Lugosi) and his pasty-faced daughter Luna (Carroll Borland), who live in the town's requisite abandoned castle. Then for some reason Professor Zelen (Lionel Barrymore) shows up suddenly, talking about killing vampires and stuff like that, and the Count and his daughter are prowling through the nights, preying on Borotyn's daughter Irena (Elizabeth Allan) and her fiancé Fedor (Henry Wadsworth). This is when things get really baffling. Mora and Luna keep showing up, turning into patently fake puppet bats or slooooooooowly wandering through the halls of their castle, which is also populated by both real animals (notably, a grinning opossum) and some more puppet creatures, like a spider so laughably fake it practically has a pair of googly eyes glued to its head. Meanwhile, Zelen is frenziedly preparing to defend against the vampires, despite the initial skepticism of local police inspector Neumann (Lionel Atwill) and Irena's guardian, Baron Von Zinden (Jean Hersholt). The film is a mad jumble of isolated scenes, each of them bizarre non sequiturs in relation to one another. The film's structure, already loose, pretty much falls apart at this point, opting for a disconnected stream of consciousness, like a distilled vision of the vampire myth, a fractured story with all the connective tissue crudely chopped away. It's the absolute essence of the vampire story: the creepy, silent vampires, their faces pale and severe, their eyes wildly staring as they hypnotize their victims; the foggy moors through which the creatures stalk; the castle strewn with spider webs and infested with vermin; the crypt from which the vampires arise at night; the dazed victims who remember little of the vampire's bite. The film is itself a hallucination, a fevered dream experienced while in the vampire's irresistible sway. Lugosi and Borland, as the vampires, get barely a word of dialogue in the entire film but they're both electric presences. Lugosi is of course the archetypal vampire, but here he sheds Dracula's courtly charm for the eerie blankness of the grave, and a sinister, leering smile that perhaps provided the inspiration for Robert Blake's monstrously cheerful demon in David Lynch's Lost Highway. Borland, heavily made up to give her a corpse-like pallor and gauntness, seems to glide through the film in her long flowing gowns, another creepy incarnation of the undead. Adding to the film's lunacy is the utterly ridiculous denouement, which twists things around in a way that explains at least some of the odd inconsistencies and gaps in the story, but at the same time creates a whole new set of problems, shattering much of the sense that could be garnered from the rest of the film. Still, it hardly matters. The film is a shambles, but its mad illogic is part of its appeal, as is its hammy overacting (Barrymore in particular is full of portentous orations, and his "good guy" character winds up being even creepier than the vampires at some points). There's always someone screaming, sending everyone rushing around from one room to the next, chasing after the source of all this commotion. And one can be sure that as soon as any given scene starts to make some sense, it will suddenly fade out to be replaced by something that throws everything into confusion again. It's a mess of a film, and though it's easy to blame studio interference, it's hard to imagine even an additional twenty minutes of footage could make sense of all this chaos. Not that I'd ever want this film to be tamed. It's delightful because of its freedom from logic, its true commitment to taking things moment by moment, scene by scene, without worrying if the film as a whole fits together or tells a coherent story (it doesn't!). In this respect, Mark of the Vampire is best appreciated as a true surrealist film, a film in which meaning and narrative are at most secondary to the pleasures of sensation, of visceral thrills, of the textures of the image. The Devil-Doll is an unsettling, complex horror film from director Tod Browning, a film that often hardly even seems like a horror film at all — it's also a story of revenge, and a family drama, and in a weird and unexpected way, also a story of redemption. The story opens with former bank president Paul Lavond (Lionel Barrymore, much less hammy than in Mark of the Vampire) escaping from prison after seventeen years behind bars. He'd been framed by his three former business partners, who had taken over his bank and his fortune while he languished in jail. He escapes with his aging cellmate Marcel (Henry Walthall) and the duo manage to make their way to an out-of-the-way cabin where Marcel's wife Malita (Rafaela Ottiano) is hiding away. It seems that Marcel and Malita are mad scientists, and Malita's been continuing her husband's work in his absence, shrinking down dogs to miniaturized size. It's another of those wacky mad scientist plots that are meant to save the world, though really it's just loony — that's what makes it mad science, I guess. Anyway, Marcel soon dies of a heart attack, and Lavond sees a perfect opportunity to use his friend's experiments as an instrument of revenge against his former associates. Along with Malita, Lavond moves back to Paris, where he disguises himself as an elderly, hunched-over old woman in a gray wig, earrings and a dress. So even with all of Paris searching for him, he hides in plain sight, setting up a doll shop and plotting his revenge. Using the shrunken figures of people, which he can control with his mind, Lavond begins methodically, one by one, enacting his vengeance on his enemies, the bankers Radin (Arthur Hohl), Coulvet (Robert Greig) and Matin (Pedro de Cordoba). The mechanics of Lavond's vengeance are simple, but Browning crafts these scenes into well-made suspense sequences. What's interesting about these scenes, and the movie as a whole, is that it's not clear who the audience is meant to be rooting for — there's no sympathy for the corrupt bankers, who certainly deserve their comeuppance, but Lavond's thirst for revenge makes him mad and sinister himself, cruel and cold. Nevertheless, Browning never allows Lavond to become fully the villain of the piece. More than anything, Lavond is motivated by his love for his daughter Lorraine (Maureen O'Sullivan), who hated him because she believed him to be guilty and blamed him for her mother's suicide. Lavond is deeply hurt by his own daughter's contempt for him, and yet he is unable to reveal himself to her, speaking to her only in disguise as an old woman. In the film's second half, Lavond's cruelty and madness are redeemed when his true purpose is revealed — not just revenge, but the possibility of happiness for his daughter, the redemption of his own image not for his sake but for hers. In a clever paradox, he makes himself a criminal, makes himself guilty of murder and worse, in order to prove himself innocent of other long-ago crimes. Despite his brutality — and despite his pre-Norman Bates cross-dressing — Lavond is basically a decent guy, even if he is rather terrifying whenever he's controlling his dolls, directing his thoughts to animate them with an intense stare. The film as a whole interestingly incorporates its sci-fi/horror premise into a melodramatic structure, creating these weird tonal ambiguities in Lavond's character. At some points, he's required to be the horror movie mad scientist, driven and frightening and capable of startling cruelty. But at other times he is sympathetic and complex; he loves his daughter and genuinely regrets that he hadn't been able to raise her. 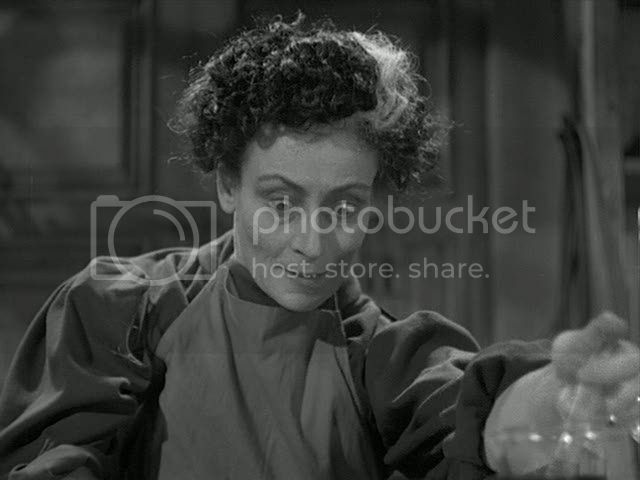 This complexity extends as well to Malita, who's more of a typical mad scientist — she even has a Bride of Frankenstein-esque band of gray hair running through the front of her frizzy, mangy hair — but who is driven by her overpowering love for her husband and her desire to fulfill his wishes now that he's gone. The film as a whole is an appealingly rough, emotionally nuanced thriller. Its effects are crude but effective, especially since Browning combines trick photography and multiple exposures with the use of oversized sets, as in a sequence when one of Lavond's tiny "dolls" scurries across a dressing table in order to steal some jewels. Browning takes a potentially silly premise and turns it into an odd, memorable little B-movie classic. I've always liked both of these films and had you watched Devil Doll sooner you could have guessed my Name That Movie clip from it, where the jewelry is stolen by the shrunken woman before poking the banker with a poison dart while he sleeps. 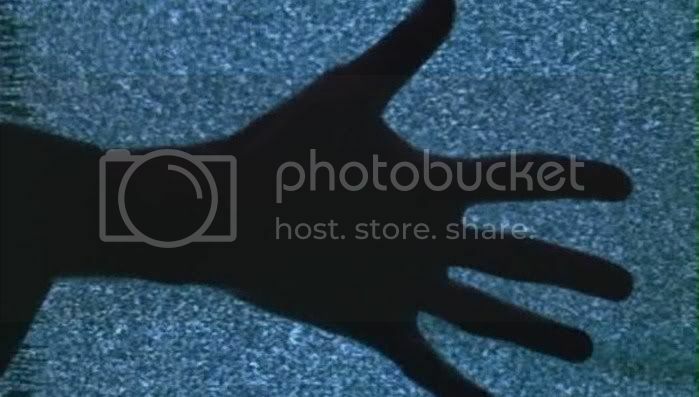 I found the scenes of the shrunken man and woman, oversized poison coated pins in hand, to be really creepy. The whole idea of their own state of being a kind of living dead, their free will and intelligence taken from them. The whole damn thing is unsettling. And in the end, he makes up with his daughter, as a kind of third party representative, and gets away. I'm still not sure, like you, who exactly I was supposed to be rooting for, if anyone but the daughter, in that movie. Thanks for writing these two up. Oh yeah, I remember thinking after that one, hey I even own that movie, if only I'd actually watched it I could've gotten a point. The little people are definitely creepy -- and also kind of sad, especially since one of them is a retarded woman who the mad doctor's wife all but kidnapped and made a servant before shrinking her down. Pretty disturbing stuff. Ed, MARK OF THE VAMPIRE is actually a re-make of sorts of Browning's own LONDON AFTER MIDNIGHT (1927) which was unavailable for 40 years. It's a well-mounted, moody, surrealist work replete with giant spider webs, smoky graveyards and imposing vampires, meant solely to cash in on the success of DRACULA. But anyone who sees Browning here as off-kilter and adventurous must look at FREAKS to know fully where he subversive slant will end up. "The film's structure, already loose, pretty much falls apart at this point, opting for a disconnected stream of consciousness, like a distilled vision of the vampire myth, a fractured story with all the connective tissue crudely chopped away. It's the absolute essence of the vampire story: the creepy, silent vampires, their faces pale and severe, their eyes wildly staring as they hypnotize their victims; the foggy moors through which the creatures stalk; the castle strewn with spider webs and infested with vermin; the crypt from which the vampires arise at night...."
--really says it all. I agree that the film is disconnected and is a mess (again, LONDON AT MIDNIGHT for various reasons is a much stronger film) and that its stream of consciouness aspect is it's most fascinating, hence I agree with you when you say later in the review that you wouldn't "want" this film to be tame. The "hallucinations" and the "fevered dreams" capturing the sensual side of the vampire does add to the literature, so to speak. Still, it's not satisfying in large measure, and it's easy to see why. DEVIL DOLL of course is a campy hoot, and one only needs to see Barrymore dressed up as an old lady to see why! Ha! In a very minor key, it's kinda fun. You really just can't go wrong with Tod Browning, can you? I'll have to watch Mark of the Vampire. I loved Devil Doll. Thankfully Turner Classics plays these and Val Lewton films quite often. Sam, I haven't seen London After Midnight and was under the impression that it was a lost film. I'm sure the original is superior, but I really love the fractured, loony quality of Mark of the Vampire. I also got a kick out of Barrymore in drag in The Devil-Doll. It says something about how hammy he is in Mark of the Vampire that his performance as a cross-dressing, revenge-seeking ex-convict is comparatively restrained. Heh. Tommy, you really can't go wrong with him; even these flawed, crazy films are tons of fun and really interesting. Both these films are also available in a great DVD box set called *Hollywood's Legends of Horror*, which among others also includes the absolutely essential Karl Freund craziness of Mad Love.